We’ve all done it. Someone tells us about an event in their life—a celebration or cause of concern—and we tell them, “I’ll pray for you.” Then it slips our mind when we get home. Our intention was good, but the follow-through wasn’t quite there. It turns out that technology can help. Often we think of prayer and worship as an escape from technology (and sometimes it should be), but the right digital tools can actually add to our prayer life. Sometimes it can be as simple as providing a space to jot down a prayer concern as soon as we hear it. Other times—like a church bell ringing on Sunday morning—it’s an audible reminder to take time out of our day for prayer. The task of sifting through the multitude of apps with “prayer” in their names can be intimidating. So I want to highlight some of the best options out there. In addition, these are all pocketbook-friendly. While there are some fantastic paid apps out there, these highlights only include free options. The most basic of options, Evernote allows you to sync notes across various devices. You can create a note for particular prayer concerns (celebration, healing, travel, etc), and then add things to those lists as they come up during the day. When it’s time for your prayers, open Evernote and pull up each of your lists. Echo is simple and has a beautiful design. You can add your prayer concerns and then list further details about them. When you click “Pray now,” the app shuffles through those concerns. You can set timers for your prayer time and reminders about particular concerns. The use of this app is intuitive and helpful: Click “Pray” when you’re ready to pray; click “Add a Prayer” when it’s time to add a prayer to your lists. For ease of use and focused purpose, Echo is the clear winner. PrayerMate is the most robust free app I’ve seen. It encourages you to group your concerns into lists, allowing you to organize, track and keep up with a much larger prayer list. As with Echo, you can set reminders and timers for prayer time. PrayerMate can also sync with your address book, helping you to send a message (email, text, social media) to the person you are praying for. Additional devotional resources and readings are available through the app as well. For breadth and depth of features and tools, PrayerMate is the best choice. Common Prayer: A Liturgy for Ordinary Radicals (Zondervan, 2010) is a print resource that mixed together traditional prayers and readings with more contemporary voices in the format of daily prayer. The app pulls the majority of the content from the book—morning, midday and evening prayers for each day, special prayers of intercession and prayers for various occasions, as well as readings and songs from across Christian traditions. 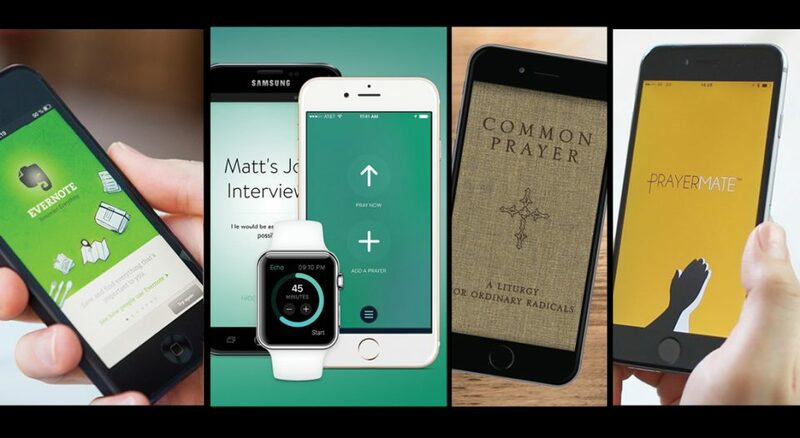 Common Prayer is less of a reminder and prayer list app, and more of a resource to help give shape to your daily prayer.